Beachfront paradise in Sea Isle on Galveston`s West End. You can`t get any closer than On The Beach! Property Size 2,038 sq. ft. The name says it all! On The Beach was built in 2017 and is located in Sea Isle on Galveston's West End. This home features a large, open living room and kitchen that lead your way to an expansive deck with unobstructed Gulf views. There are 4 bedrooms, two downstairs and two upstairs, all with beach views. The master suite is on the top level and features its own private balcony. With the sleeper sofa, this home accommodates up to 11 guests. 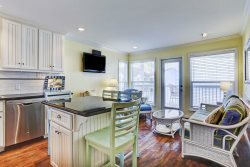 Sea Isle is a great community with a ton of amenities, including a swimming pool, tennis court, restaurant, sports bar, bait shop, fishing pier and marina.